The Icelandic horse has five natural gaits, its special gaits - tölt & flying pace - making it a fascinating ride. Tölt, a four-beat gait, will carry the rider smoothly over long distances and up to over 20mph fast - so smoothly that the rider is able to carry a filled cup without spilling a drop. The powerful, exhilarating flying pace is the king discipline with the fastest horses running at almost 35mph over short distances. The sure-footed horses are brave, willing, arduous & hardy. They average between 13 and 14 hands & will safely carry adults. Their gaits are their specialty, but their versatility will allow for use in other disciplines like endurance, jumping, driving & dressage. 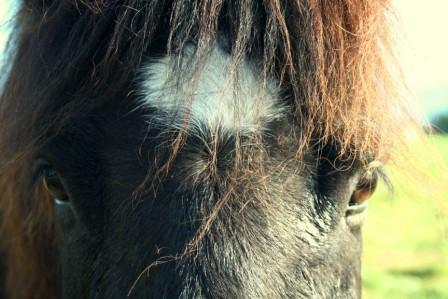 This horse is an easy keeper & highly social & will thrive living in herds. The charismatic horse originated on the remote island of Iceland, where the purity of the breed & the complete lack of equine diseases have been preserved through an import ban for over 900 years. This is the reason why no Icelandic horse World Championship will be able to take place in the horse's country of origin. Any horse that leaves Iceland will never be able to return. Registered Icelandic horses in the U.S. have to prove a complete lineage back to Iceland.